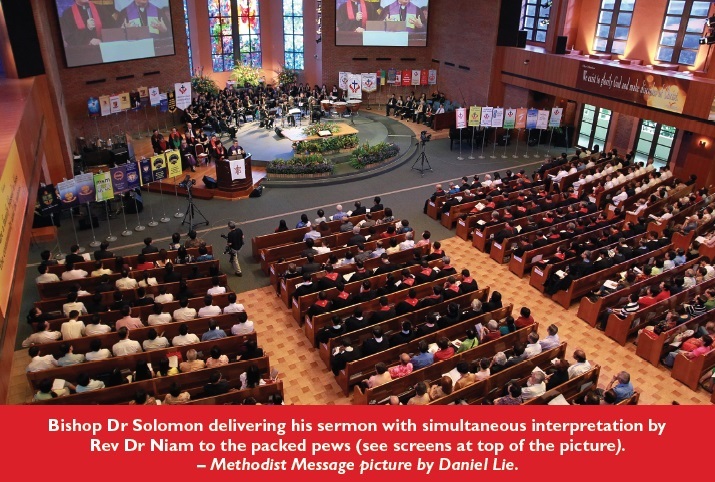 MORE THAN A THOUSAND VOICES SANG and praised God as a people called Methodists worshipped Him at the Combined 125th Anniversary Thanksgiving and Aldersgate Service at Paya Lebar Methodist Church on May 22, the highlight of Aldersgate Convention 2010. The large turnout of Methodists from churches of the three Annual Conferences and guests also saw for the fi rst time, a colourful Parade of Banners by all the Methodist churches, aﬃliated agencies and schools. 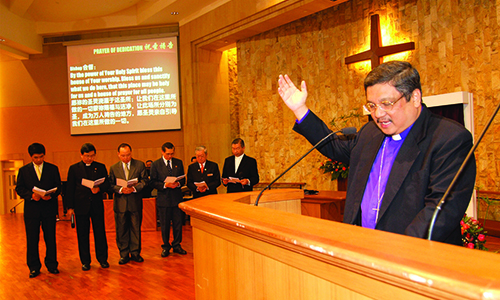 In the past, only banners from the General Conference of The Methodist Church in Singapore (MCS), the Chinese Annual Conference (CAC), Emmanuel Tamil Annual Conference (ETAC), Trinity Annual Conference (TRAC), and the Women’s Society of Christian Service (GC-WSCS) were featured in addition to the carrying of the Cross and the Bible. After the procession, the colourful banners were displayed all around the church’s sanctuary, with some hanging down from the gallery panel on the mezzanine floor to show the church as a single, united body. It set the mood for Bishop Dr Robert Solomon’s sermon entitled, “Jesus Prays for Us”, which had unity of the church as one of its main themes. 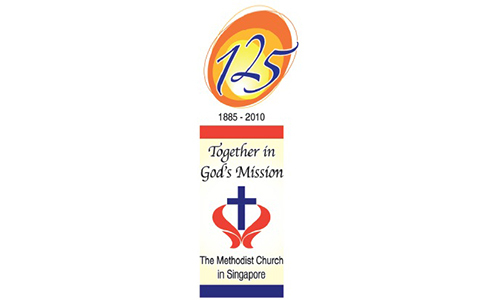 With simultaneous Mandarin interpretation by the Rev Dr Niam Kai Huey, a CAC pastor, the Bishop said as Methodists celebrate 125 years of Methodism in Singapore and God’s faithfulness and goodness, guidance and grace throughout the period, he would like to link the theme of the anniversary celebration, “Together in God’s Mission”, with the High Priestly Prayer of Jesus. The prayer, he said, began with praise for God’s glory and in the second part, Jesus began to pray for the unity of His disciples. Likewise, he reminded his flock that the MCS, like the banners on display, represented the various conferences, churches, schools and agencies. “We must be led by God, be united and move in the same direction,” he said. He pointed out two enemies Jesus had mentioned and wanted to protect His disciples against: Satan, the devil, and the world we are living in. “Let us not underestimate the wiles of the evil one in bringing about disunity in the church by causing a sleeping sickness in our souls and by causing unnecessary battles over unimportant things,” he said. On the second enemy, the world, he said all believers must beware of two dangers: Persecution against them and the result of worldliness. But, he said, history had shown that persecution seldom caused disunity in the church. “In fact, it often heals disunity and brings about a new unity of the spirit,” he said. So Jesus must have been more concerned with the danger of worldliness in His prayer for His disciples, he concluded. The Bishop said that in the consumerist world we live today, worldliness is connected with wealth. “The materialistic and consumerist pursuit of wealth and power can destroy our souls. Pointing out that John Wesley worried a lot about this too, he said that wealth had the potential to weaken our devotion to Christ. It could also weaken our covenant with one another. Members of the church would stick together when they were not self-suﬃcient. But once they acquired wealth and influence, they would behave like the dysfunctional church when one part of the body tells another that it does not need it. The third part of Jesus’ prayer for us, Bishop Dr Solomon said, was God’s mission, which is the evangelisation of the world. Using a chart to illustrate the development of Methodism in the United States between 1750 and 2000, he showed that the Methodist decline began as early as 1850 when circuit riders were exchanged for more settled and educated clergy with eﬀorts made to have them accepted by those with status in society. 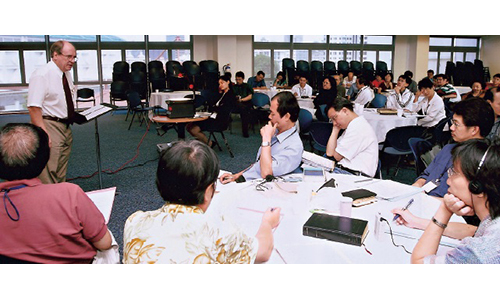 Similarly, in today’s Singapore, he said that the number of Methodists might still be increasing each year, but if the rise could not match the increase in the total population, Methodism here would still be declining. • Presentation of cash prizes to the winner and two commendation prize winners of the 125th Anniversary Logo Competition. 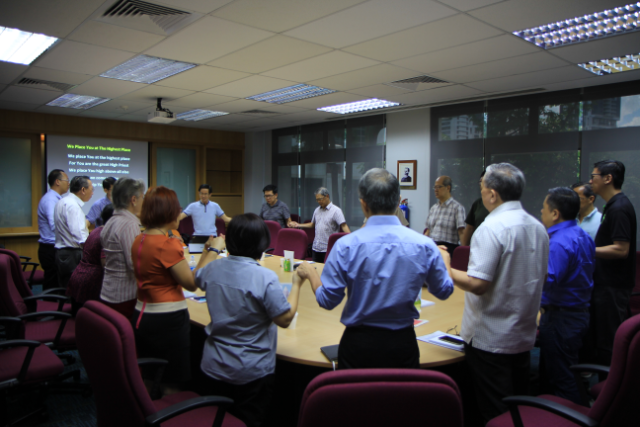 Leong Weng Kam is an Associate Editor of Methodist Message.